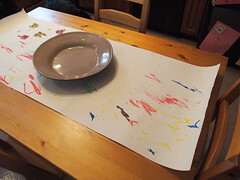 While ripping off Sophie’s latest easel painting in order to pull down some fresh paper, my mom suggested using it as a table runner. It’s perfect. The table is a cheap Ikea pine number with deep scratches on it (Tucker). The painting covers much of the surface nicely and serves as a fun conversation piece. “Sophie, what’s that?” (pointing to a scribble). “And what’s that?” (pointing to a nearly identical scribble). “And that?” (pointing to yet another scribble). This entry was written by kara, posted on October 12, 2010 at 10:21 pm, filed under Uncategorized and tagged art, dinner, Sophie. Bookmark the permalink. Follow any comments here with the RSS feed for this post. Post a comment or leave a trackback: Trackback URL.